Heard about the “Dry January” campaign in the UK? The idea is to go a month with no alcohol and see how you feel. Some data indicate people tend to drink less, then, over the following six months. Others say there’s no evidence it changes anything. A recent book, This Naked Mind: Control Alcohol, Find Freedom, Discover Happiness & Change Your Life, by Annie Grace, talks about an intelligent way to change your mind about how much you drink. Her approach, which explains our unconscious bias in favor of drinking and also brims with facts about the extraordinary dangers of alcohol – like it’s literally poison (ethanol) and that it is progressively addictive to anyone who drinks it, not just to so-called “alcoholics” – is based on the highly praised work of Dr. John Sarno in helping people rid themselves of chronic back and other pain. Those who choose to forego alcohol or indulge only sparingly have always been hampered by a lack of sophisticated drink alternatives. Club soda with a lime is okay, but it gets boring fast. Most flavored club sodas have a distinctly unpleasant metallic and fake taste. And some diet soda sweeteners are under severe scrutiny. So what’s a non- or light-imbiber to do? A newcomer to the market known as Cascade Ice Water sparkling beverages sent some samples recently. The brand comes in 30 lightly carbonated flavors, all of which are sodium, sugar, caffeine and gluten free. The zero-calorie flavored sparkling variety is made with 1% fruit juice and, honestly, we would love to know how they manage to make the aroma of fresh apples greet your nose when you open the McIntosh Apple. Seriously, it’s reminiscent of standing in the cellar-temperature apple shack we used to trek out to every October in Cleveland, Ohio to see the magnificent fall colors and buy apples. And how do they get the Strawberry-Orange-Mango to smell and taste like that when the only fruit-related ingredient is pear juice? These guys clearly have some blending magic tricks under their cloaks. By the way, if you’re still drinking red wine, mix some into that Strawberry-Orange-Mango water and you’ve got yourself instant sangria. The flavors in this line are lightly sweetened with sucralose, an artificial sweetener considered safe by the FDA. We found it refreshing, not too sweet and at the same time affording some unique flavor sensations. And then we happily realized we’d consumed no sugar or caffeine and hadn’t been dosed with aspartame (said to contribute to cancer, stroke and other risks). 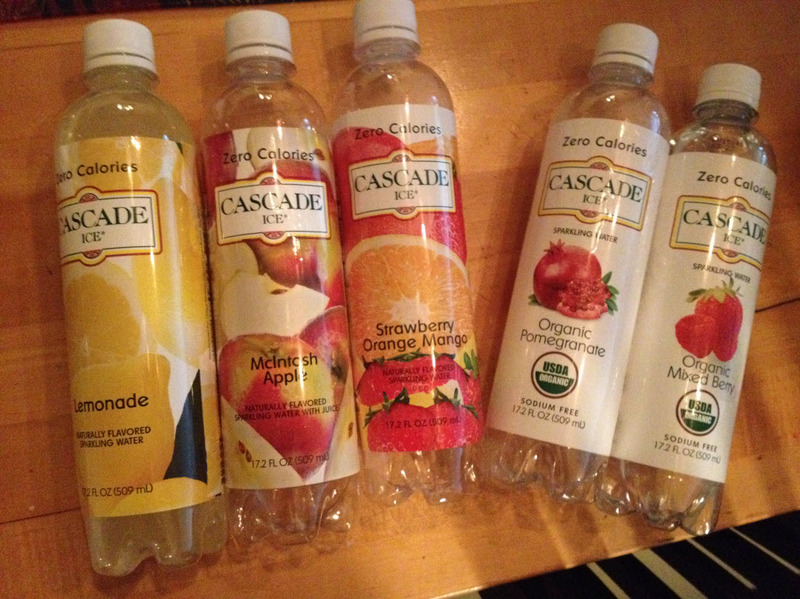 Another variety of Cascade Ice is its zero-calorie organic sparkling fruit waters. These are lightly carbonated and contain no sugar, caffeine or artificial sweeteners of any kind. Ingredients in the organic waters include only purified water, carbonation and essences from fruit oils and extracts. We were truly surprised and delighted by the clean, fresh, non-fake taste of the flavors of the samples of this variety. Talk about healthy alternatives! Cascade Ice’s zero-calorie fruit sparkling waters are made with small amounts of various fruit juices as well as a few traditional long-name ingredients like potassium benzoate (a preservative) and artificial colors. The zero-cal organic water comes in a multitude of mixed fruit flavors like blueberry-acai-pomegranate, coconut-mango, pink grapefruit, raspberry lemonade and 15 others, but keep in mind, these are not sweet. They’re nice-flavored sparkling waters made with organic fruit essences. Let your imagination run free in combining these sparklers with other ingredients, or check out Cascade Ice’s recipes ideas online. In Chicago the organic waters are available at Kroger, Target, Jewel-Osco and other retailers. The regular sparkling water is available in Illinois at Shop ‘n’ Save. 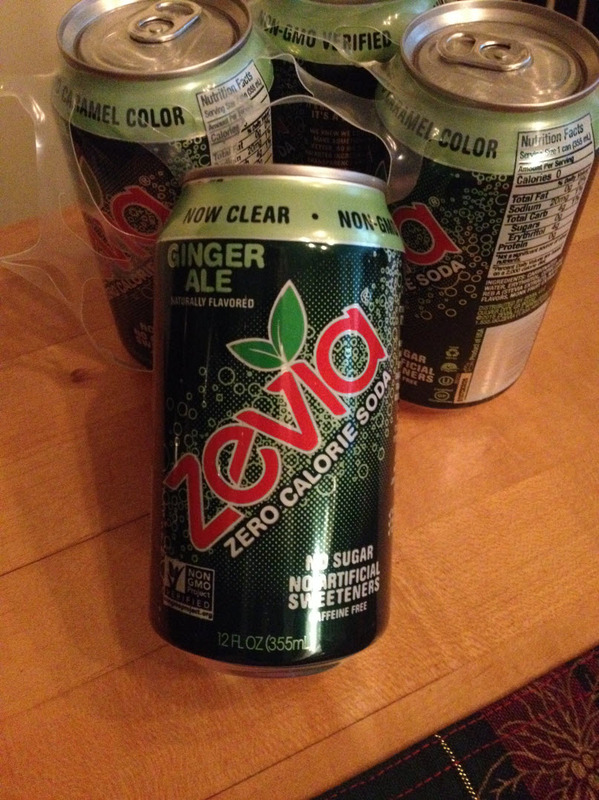 And if you want a regular soda that’s just sweet and fizzy without any artificial sweeteners, check out Zevia, soda sweetened with all-natural stevia. It comes in a bunch of flavors. The only ones we’ve tried were black cherry and ginger ale. The black cherry was too strong and too sweet for us, but we like the ginger ale for just plain sipping.